A talk on understanding when a reader-writer lock beats a mutex, and when not. In multithreaded programming, it’s important to make threads wait. They must wait for exclusive access to a resource. They must wait when there’s no work available. 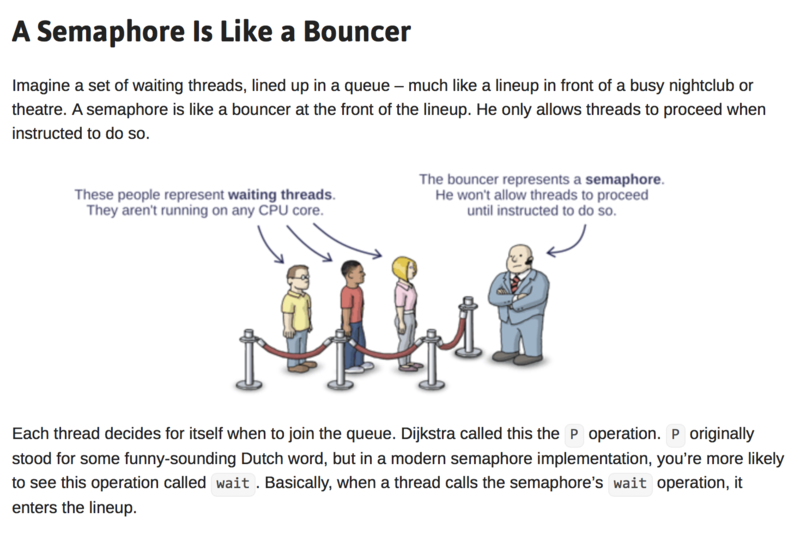 One way to make threads wait – and put them to sleep inside the kernel, so that they no longer take any CPU time – is with a semaphore. I used to think semaphores were strange and old-fashioned. They were invented by Edsger Dijkstra back in the early 1960s, before anyone had done much multithreaded programming, or much programming at all, for that matter. I knew that a semaphore could keep track of available units of a resource, or function as a clunky kind of mutex, but that seemed to be about it.